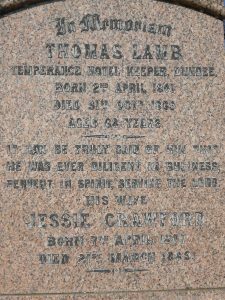 One of Dundee's "most respected citizens" whose name was familiar to every inhabitant through his temperance hotel and hall, coffee houses, reading, refreshment and dining rooms. He was a zealous supporter of the Albert Institute and Free Public Library. Lamb's Temperance Hotel. Reform Street, Dundee. Lamb's Temperance Hotel, Reform Street, Dundee. Director, Albert Institute Ltd., 1867-1869. Honorary director, Dundee Temperance Society, 1869. Subscriber no.55 – W.E. Baxter – speaker at the opening of Lamb’s Temperance Hotel. Subscriber no.260 – Lord Kinnaird – presided at the opening of Lamb’s Temperance Hotel. 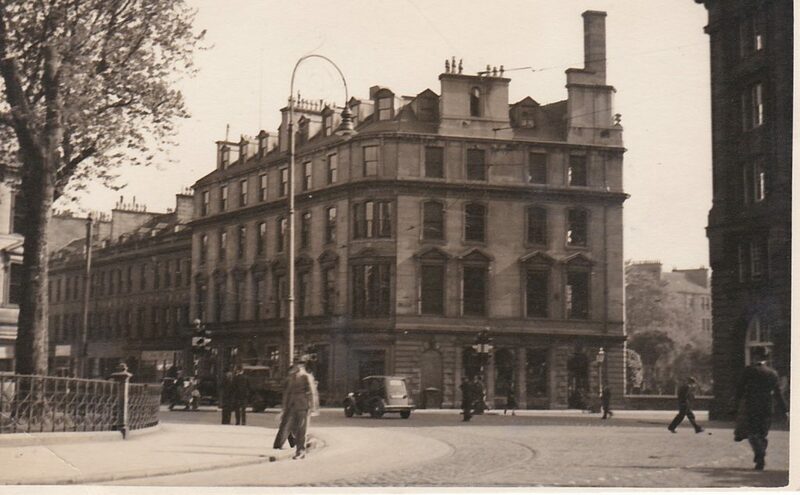 Dundee Coffee House, 69 Murraygate, Dundee. Lamb's Tea Gardens, Top of Reform Street, Dundee. Coffee House and Reading Room, West Port, Dundee. Lamb's Temperance Hotel, 52-60 Reform Street, Dundee. 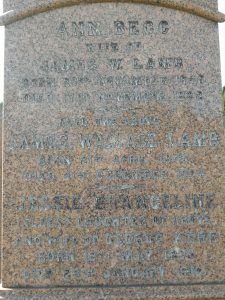 Thomas Lamb was the son of John Lamb, linen manufacturer, and Elisabeth Mackie (Mackay on Thomas's death certificate). 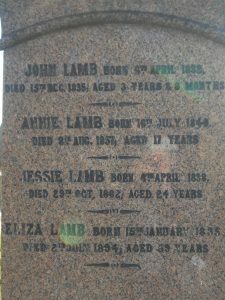 John Lamb was a small manufacturer in the Forebank area of Dundee and a man of "strict principles", from whom Thomas received his early religious training. After leaving school Thomas became a handloom weaver, but yearning for an outdoor life he was apprenticed to relatives in Cupar, Fife, to train as a nurseryman. He went on to find a position as a gardener at Castle Huntly, but had to give it up due to bad health. He returned to Dundee where he took up the trade of grocer and spirit merchant in the Murraygate. During the temperance agitation of 1828 Thomas attended several lectures by William Cruickshanks, the tee-total coal carter, after which he was convinced that it was wrong to indulge in strong liquor, but even worse to sell it. Accordingly he destroyed all his remaining stock rather than recoup his outlay and with the support of his wife, Jessie Crawford(1807-1889), commenced business as a confectioner. The financial loss was somewhat compensated by the friends it made him in the local temperance movement. In addition to his confectionery business Lamb converted the room above his shop into a coffee house and the success of the venture led him to rent several more apartments in the building. He provided a large reading room that was frequented by the local literary men and immortalised in "the Halls of Lamb" a parody of Lord Byron's "The Isles of Greece". Lamb had made a name for himself as the purveyor of "soirees and festive meetings" gaining almost a monopoly of such business. In 1838 he erected a wooden booth on the west side of Reform Street for the sale of temperance refreshments. The temporary, but cosy, buildings included a reading room and a hall which could accommodate 200 people. Calling on his experiences as a nurseryman and a gardener, he subsequently laid out the adjacent grounds with flower beds, gravel walks, a rockery, a fish pond and a fountain. These became Lamb's Tea Gardens. In 1844 he also provided a commodious coffee house and reading room at the West Port. The success of his various ventures convinced Lamb that there was a demand for a temperance hotel, one that could also cater for the needs of the commercial traveller. His Dundee Coffee House was already providing overnight accommodation. 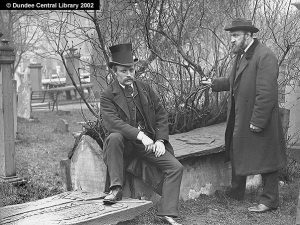 He built the hotel on the site of his tea garden and it opened in 1852 with a dinner presided over by Lord Kinnaird and addressed by W.E. Baxter. 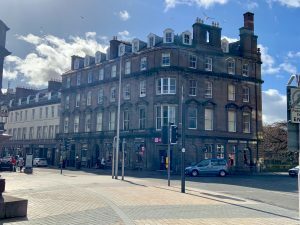 It became, along with the Dundee Coffee House, one of the principal hotels in Dundee. In due course Lamb decided to concentrate all his business on the Reform Street premises and Mrs Mathers took over the Dundee Coffee House. Even before building a permanent structure the Lamb's Temperance Hall was to let for "sales, exhibitions, meetings etc." and the Society for the Suppression of Intemperance met there every Tuesday and Saturday evening. 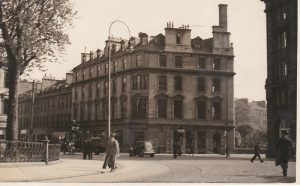 After the construction of the hotel a number of other local organisations held their meetings there: the Albion Literary Society, the Angus Chess Club, the Dundee branch of the Scottish Reformation Society. Meanwhile the Temperance Literary Society and the Ornithological Society held their meetings at the Dundee Coffee House. As a cause close to his heart, Lamb allowed orders for Scottish Temperance League publications to be left at Reform Street for attention. On a more commercial footing he allowed orders for John Methven & Son, boot and shoemakers, Broughty Ferry, to be left at the Murraygate coffee house and orders for the same firm for cod liver oil at the Reform Street hotel. The United Original Seceders held their meetings in Lamb's Hall temporarily and for a few years Lamb's own church, the Baptists, held their services there. Thomas had been brought up as an Independent in religion and had attended Dr. Russell's Ward Chapel of Congregationalists until a disagreement led to his and a number of other members' departure in 1835. He helped form another church, which latterly became Baptist. New members were immersed in the Dichty Water. He remained an "ever faithful and consistent member" of the Baptist Church for the rest of his life. 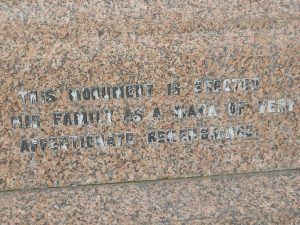 Lamb was not a good public speaker "owing to an unfortunate hesitancy in his speech, he was unable to express his thoughts with rapidity, but never failed to make his remarks particularly pointed, and hence he always commanded a very attentive hearing." Others found his attempts at public speaking "risible in some respects" but usually very practical. In the days of Sir George Kinloch, the Voluntary Controversy and the Anti-Corn Law League he always took the Liberal side. He took a particular interest in the Albert Institute and the formation of a free public library. As a "zealous supporter" he offered £50 to the initial subscription and on finding that the total was not up to the mark gave another £50. Thomas Lamb’s Temperance Hotel with its coffee, dining, refreshment and reading rooms and the attached Lamb’s Temperance Hall proved a great success and by 1866, it was found necessary to expand the premises to occupy the north-west corner of Reform Street, diagonally across from the site chosen for the Albert Institute. The result was a “large and handsome block” which opened shortly before the visit of the British Association in 1867, drawing favourable comment from many of the participants. Lamb’s commitment to the Albert Institute was recognised when he became one of its directors. 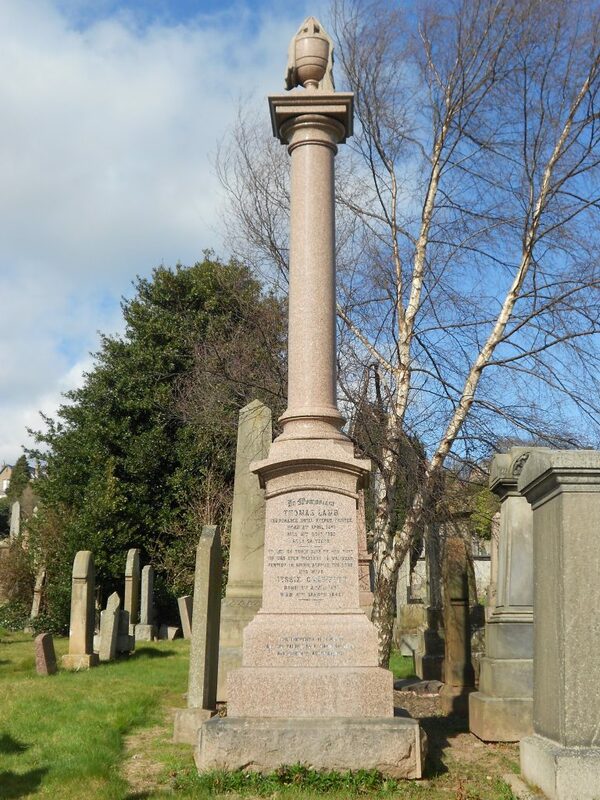 His forty years of commitment to temperance was also acknowledged by his appointment as an honorary director of the Dundee Temperance Society. His son, Alexander C. Lamb, was already one of its directors. 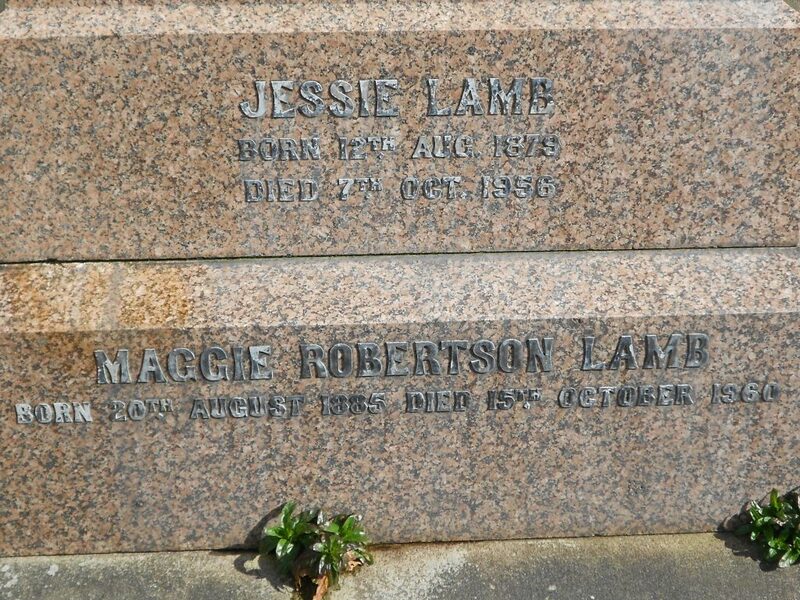 At least two of Lamb’s daughters died young: Ann, aged 17 in 1857 and Jessie, aged 24 in 1862. 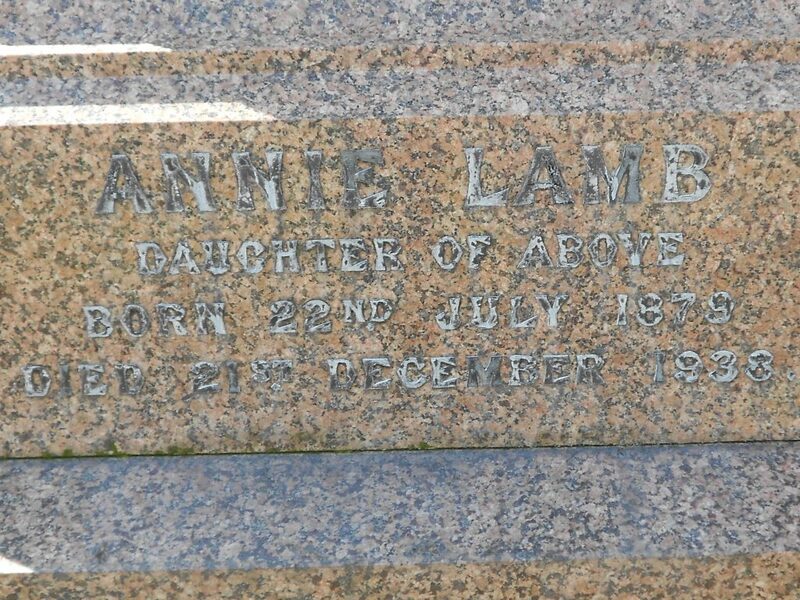 Thomas Lamb died in 1869 leaving an estate worth £3,082 8s. 7d. which included rents on properties in Murraygate, Reform Street and Albert Street. 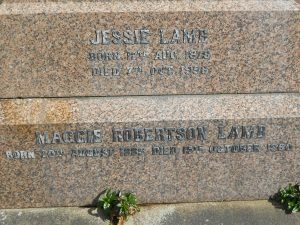 After his death the business was carried on by his widow, Janet (usually known as Jessie) and their children, Alexander, Eliza and James. All four of them were described as hotelkeepers and confectioners in the 1871 census. 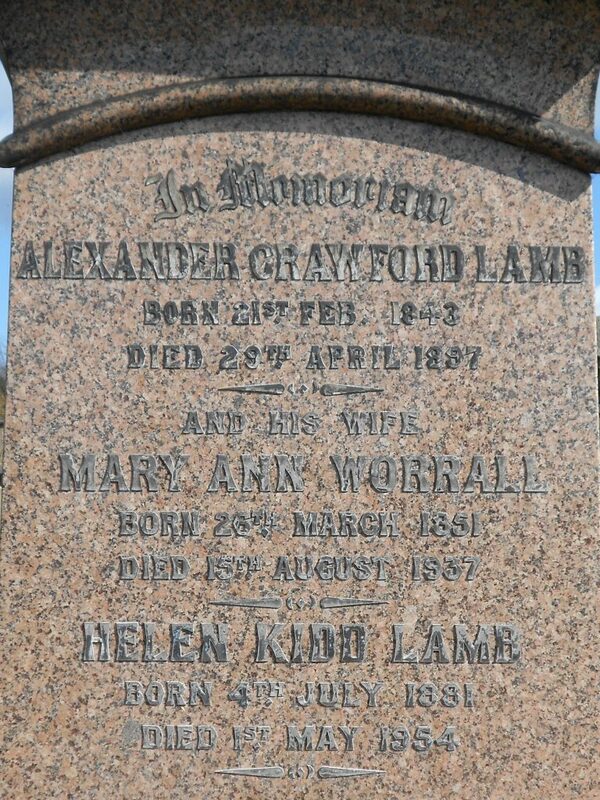 Jessie Crawford Lamb died in 1889 leaving an estate of a little over £1500. 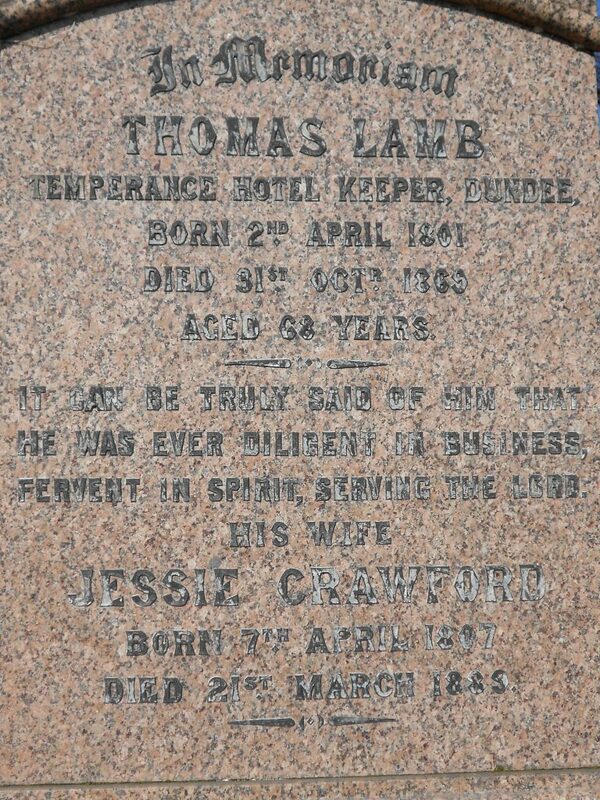 Alexander, Eliza and James, temperance hotelkeepers, Dundee, her children, were named as executors. Alexander is best known for the impressive Dundee: Its Quaint and Historic Buildings, an “elephantine” publication which “virtually bankrupted the family but preserved the architectural history of Dundee for posterity.” He was an author and bibliophile who compiled a collection, now preserved in the Central Library, Dundee, which provides a pictorial and literary history of Dundee in the late Victorian period. It was said of Thomas Lamb that he “was one of the many men who, through their own unaided industry, raised themselves from an obscure to a prominent position. His history is one of the most remarkable triumphs on record, not of splendid natural talent, but of perseverance and self-denial in the prosecution of an honest and upright calling.” It was also noted that “during his long and useful career, Mr Lamb always took a keen and active interest in everything that concerned the interests of the town.” He was said to have been a “genial and kindly” man and one who showed liberality to the poor of the town. The Lamb Family were descended from weaving “manufacturers” in the Dens. 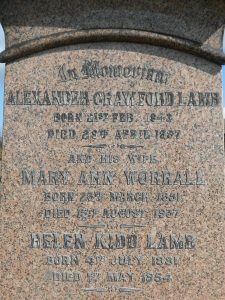 His wife Janet Crawford was the daughter of Alexander Crawford shoemaker from Mains of Fairmuir. 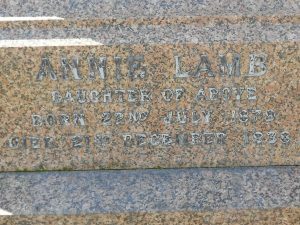 Thomas Lamb was related via his wife to the Mathers’ temperance hotel family. Beggs the tailors – grandson James married into family. Through Granddaughter’s marriage into the Stevensons they became distantly related to the Philips (Watson & Philip) the Cleghorns, the Carmichaels, and many others. 2 Grandsons went out to Canada as Pioneers. George died aged 35 but Thomas went on to marry a Mabel Skippen and eventually moved to California, where some descendants (through the female line) remain to this day. Other descendants with connections further back are known to live in New Zealand. His Granddaughter Mary (1873-1953) married Roderick Talbot Stevenson (The Dyer Family). George Warral (Hecklemaker) was his son Alexander’s father-in-law. Old Parish Records. Dundee. Baptism. 11 April 1802. 282/80 527. ScotlandsPeople website. Dundee Courier, 1 November 1869. British Newspaper Archive website. Old Parish Records. Mains & Strathmartine. Banns. 13 June 1828. 307/50 68 and Dundee. Banns. 2 July 1828. 282/210 249. ScotlandsPeople website. 1851 Census Scotland. Dundee. 282 ED15 p.6. Ancestry website. 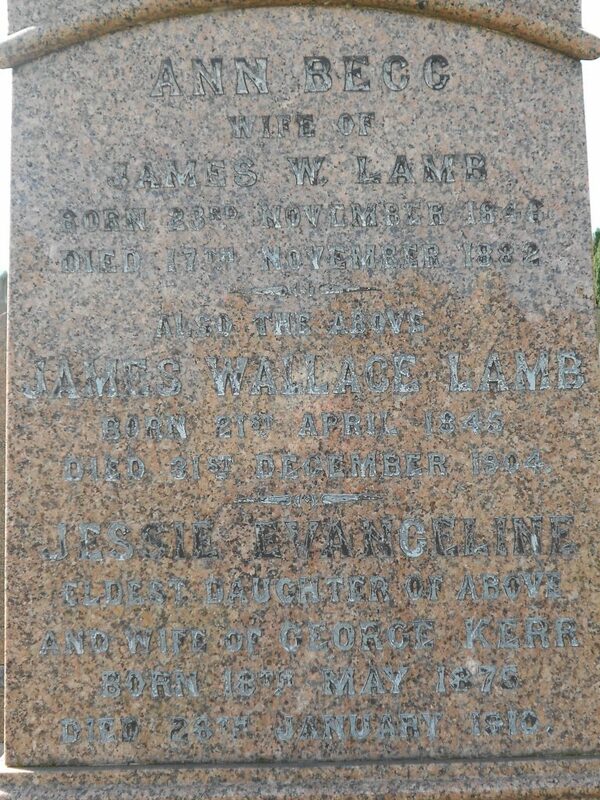 Lamb family headstone, Western Cemetery, Perth Road, Dundee. 1861 Census Scotland. Dundee Second District. 282/2 ED9 p.5. Ancestry website. John Irvine's family research and private collection of Lamb material. Dundee Directories, 1853-1869. Local Studies, Central Library, Dundee. Statutory Registers. St Clement's, Dundee. Death. 31 October 1869. 282/3 590. ScotlandsPeople website. 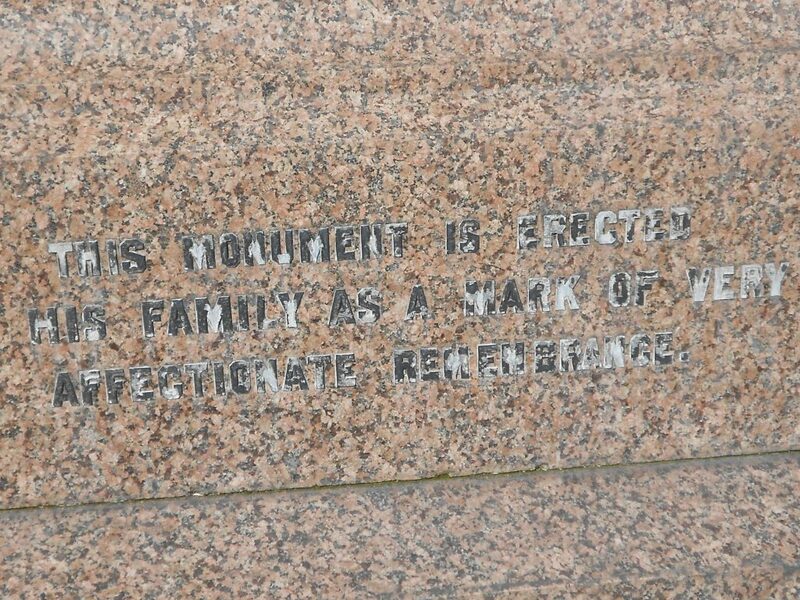 Western Cemetery, Dundee. Index of Lair Holders. Friends of Dundee City Archive website. Northern Warder and General Advertiser for Counties of Fife, Perth and Forfar, 2 November 1869. British Newspaper Archive website. Dundee Directories, 1867-1869. Local Studies, Central Library, Dundee. Norrie, W. (1873) Dundee Celebrities of the Nineteenth Century. Dundee: William Norrie. Local Studies, Central Library, Dundee. Dundee Directories, 1853-1862. Local Studies, Central Library, Dundee. Statutory Registers. Dundee Second District. Death. 1857. 282/2 643. ScotlandsPeople website. Statutory Registers. Dundee First District. Death. 1862. 282/1 1053. ScotlandsPeople website. Testamentary records. Dundee Sheriff Court. 14 September 1870. SC45/31/22. ScotlandsPeople website. 1871 Census Scotland. St. Clement, Dundee. 282/3 ED8 p.14. Ancestry website. Calendar of Confirmations and Inventories, 1889. Ancestry website. McKean, Charles and Walker, David. (1984) Dundee - An Illustrated Introduction. Edinburgh: Royal Incorporation of Architects in Scotland/Scottish Academic Press. Scott, Andrew Murray. (2003) Dundee's Literary Lives Vol 1: Fifteenth to Nineteenth Century. Dundee University Archive Services. 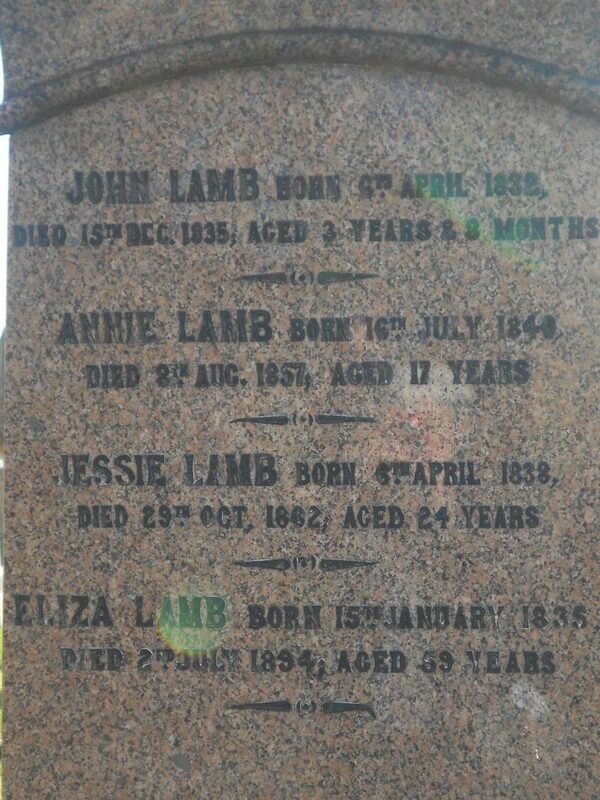 The Lamb family research by John Irvine including an article in The Scottish Local History Journal in Autumn 2013. Staff at Local Studies, central Library, Dundee. The information above about Thomas Lamb has been collated from a range of digital and hard copy sources. To the best of our knowledge it is correct but if you are relying on any information from our website for the purpose of your own research we would advise you to follow up the sources to your own satisfaction. If you are aware of an inaccuracy in our text please do not hesitate to notify us through our Contact page.